Powered Plant Proficiency: Disc cutter, Needle gun, Angle grinder, tensors (Stressing Kit), Rail profile grinder, Generators, Weld shear. Weld-A-Rail have a documented approach to staff development and training supported by a training budget and are committed to continuous development and educational training initiatives. Performance reviews are carried out annually by managers for all staff at which training needs are established against personnel development and the requirements of the business. Training records and competencies are retained / recorded in the company’s training database “Auto Alert”. Where track safety certification is held these are reconciled with the NCCA. The company produce job specifications for all individuals on appointment / promotion to or within Weld-A-Rail respectively. 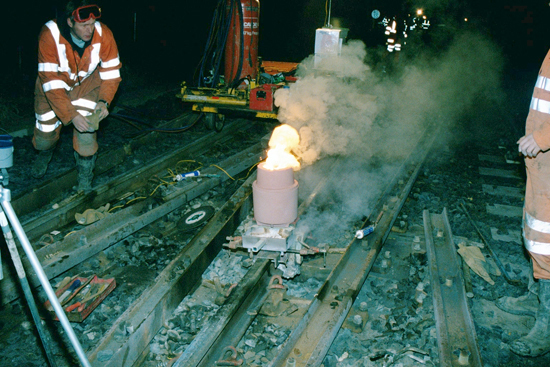 All staff engaged on the provision of track welding services hold Personal Track Safety (PTS) certificates. Weld-A-Rail maintain records of expiry dates for PTS certificates, Drugs & Alcohol testing, Medicals and all other competencies associated with track welding services on “Auto Alert” the company’s Training & Competency database. PPE requirements are identified as a result of the risk assessment process and legislative and regulatory requirements. The use, care and appropriateness of PPE is monitored and fed back into the risk assessment process.